The next argument scheme we will look at is what’s known as the argument from ignorance. An argument from ignorance (or argumentum ad ignorantium if you want to be fancy) is one that asserts that a claim is (probably) true because there is no good evidence showing that it is false. It can also be used the other way to argue that a claim is (probably) false because there’s no good evidence to show that it’s true. Arguments from ignorance, when weak, are typically used to exploit uncertainty. That is, they typically function to (attempt to) undercut good abductive inferences. Like any inductive argument, an argument from ignorance can be cogent or weak. There’s no good evidence to show that the ancient Egyptians did have digital computers. (This evaluation comes from professional archeologists), therefore, they likely didn’t have digital computers. There’s no good evidence to suppose the earth will get destroyed by an asteroid tomorrow. (This evaluation comes from professional astronomers), so we should assume it won’t and plan a picnic for tomorrow. There’s no good geological evidence that there was a world-wide flood event. (This evaluation comes from professional geologists); therefore, we should assume that one never happened. P1: There’s no (good) evidence to disprove (or prove*) the claim. P2: There has been a reasonable search for the relevant evidence by whomever is qualified to do so. C: Therefore, we should accept the claim as more probable than not/true. C*: Therefore, we should reject the claim as improbable/false. The argument from ignorance is philosophically interesting because the same structure can be used to support both positions. The classic example is the debate over the existence of God. Let’s look at how both sides can employ the argument from ignorance to try to support their respective position. P1: You can’t find any evidence that proves that God or gods don’t exist. P2: We’ve made a good attempt to find disconfirming evidence, but can’t find any! C: Therefore, it’s reasonable to suppose that God or gods do exist. P1: You can’t show any evidence that God or gods do exist. P1*: Any evidence you present can also be explained through the natural laws. C: Therefore, it’s reasonable to suppose that God/gods don’t exist. This particular case brings out some important issues we studied earlier in the course such as bias and burden of proof. Not surprisingly, theists will find the first argument convincing while atheists will be convinced by the latter. This of course brings up questions of burden of proof and target audience. When we make a claim for something’s existence, is it up to the person making the claim to provide proof? Or does the burden of proof fall on the critic to give disconfirming evidence? In certain questions, your biases and world-view will pre-determine your answer. While in the above issue, there is arguably reasonable disagreement on both sides, there are other domains where the argument from ignorance fails as a good argument. As you might guess, this will have to do with the acceptability of P1 (i.e., there is/is no evidence) and P2 (i.e., a reasonable search has been made). Most criticism of arguments from ignorance will focus on P2 since it often turns out that consideration of possible competing explanations wasn’t as extensive as the arguer thinks. Claim: There’s no evidence to show Obama is American, therefore he isn’t American. P1: I’ve encountered no good evidence to show that Obama is an American citizen. P2: Numerous agencies and individuals trained in the search and identification of state documents have been unable to locate any relevant documents. C: Therefore, Obama isn’t American. Notice how I’ve applied the principle of charity to (P1). The arguer states that “there is no good evidence”. This is false. More reasonably, they simply aren’t aware of it. I could have interpreted (P1) as the stronger claims “there is no good evidence that…” but we’ll be charitable and accept their testimony. Regarding (P1), maybe it’s true that the arguer hasn’t encountered any evidence so we’ll interpret it that way. That said, it wouldn’t be wrong to reconstruct the argument with the stronger claim (e.g., there is no good evidence that…). It would just be less charitable. Even if we are charitable with (P1), (P2) has problems. There have been reasonable searches for evidence, and that evidence was found. Perhaps, the arguer was unaware or didn’t truly exert him/herself enough. The argument fails because P2 is not acceptable (i.e., false). We can also typically find the argument from ignorance used in arguments against new (or relatively new) technologies in regards to safety or efficacy. Example: We should ban GMO soy because we don’t know what the long-term human health effects are. P1: I’ve found no evidence that shows that GMO soy is safe for human consumption. P2: Those qualified to do studies and evaluate evidence have found no compelling evidence to show that GMO soy is safe for human consumption. C: Therefore, we should assume GMO soy is unsafe and ban it until we can determine it is safe. If we were to criticize this argument we’d consider (P2). In fact, there have been quite a few long-term studies done by those qualified to assess safety. At this point we will have a debate over quality or reliability of the evidence. Some on the anti-GMO side dispute the reliability of the evidence. They might argue that it was funded by a company with a vested interest its reliability is questionable. However, there are also many high quality independent studies as well as a full review by the national academy of sciences.12 In a full analysis we’d consider this question in depth, but for our purposes here, we might legitimately challenge the claim that there is no available evidence purporting to demonstrate safety. As an aside, we should recall that burden of proof can shift over time. When GMOs were first introduced, an argument from ignorance against them would have been cogent since (P2) would have been true. However, over 30 years have passed and so it is no longer true. Notice that we can also use the argument from ignorance for the opposite conclusion: There’s no compelling evidence to show that GMOs are unsafe for human consumption in the long-term, therefore, we should continue to make them available. The “team” that wins this battle of arguments from ignorance will have much to do with our evaluation of (P2). The argument whose (P2) is most acceptable will be the more cogent argument. And since inductive arguments are probabilisitic, we should go with the one that is most likely to be true. There’s no evidence that X doesn’t exist, therefore it does. You can’t prove that X doesn’t exist, therefore it does. Explanation: The arguer is making a non-falsifiable claim. You can’t prove something exists with the absence of evidence, otherwise we could prove absolutely anything exists. Substitute any fairy tail creature into the above structure and you’ll see why. E.g., You can’t prove that magical flying monkeys don’t exist, therefore they do. The reason why this kind of argument fails is because the arguer is asking his opponent to provide negative evidence, which is impossible. P1. There’s no reasonable evidence to show that magical flying monkeys don’t exist. P2. There has been a reasonable search by relevant experts for evidence that flying monkeys don’t not exist. C. Therefore, magical flying monkeys exist. Providing evidence that something doesn’t not exist is an impossible task and so the argument is bad. You don’t win arguments by putting on impossible burden of proof on your audience. We can look at arguments from ignorance as probabilistic arguments. That is, given that there is little or no evidence for an explanation, what is the likelihood that it is correct? This is especially true for claims that something does exist based on an absence of evidence for its non-existence. However, as Carl Sagan famously said, “absence of evidence is not evidence of absence.” In other words, just because we can’t find direct evidence for something, doesn’t follow automatically that the thing or phenomena doesn’t exist. There might be indirect evidence. (Of course you’d have to show this if you wanted to make this claim). On the flip side, this style of argument can also be used to support improbable claims. Consider such an argument for the existence of unicorns or small teapots that circle the Sun: There’s no positive evidence that unicorns don’t exist or small tea pots don’t circle the Sun, therefore we should assume they exist. At this point we should return to the notion of probability: Given no positive evidence for these claims, what is the probability that they are true versus the probability that they aren’t? It seems that, given an absence of evidence, the probability of there being unicorns is lower than the probability that they do not exist. The same goes for the teapot. In both cases, these are fair inferences because not only is there no direct positive evidence but there is no indirect evidence either. Typically, we say that the burden of proof falls on the person making the existential claim. That is, if you want to claim that something exists or that some variable explains an observation, the burden is upon you to provide evidence for it, otherwise, the reasonable position is the “null hypothesis.” The null hypothesis just means that we assume no entity or phenomena exists unless there is positive evidence for its existence. In other words, if I want to assert that unicorns exist, using the argument from ignorance won’t do. It’s not enough for me to make the claim based on an absence of evidence. This is because, we’d expect some evidence to have turned up by now if there were unicorns. That is to say, we wouldn’t likely accept (P2). This brings us to another Carl Sagan quote (paraphrasing Hume): “Extraordinary claims require extraordinary evidence.” Or as Hume originally said: “A wise man proportions his beliefs to the evidence.” Claiming that unicorns exist is an extraordinary claim and so we should demand evidence in proportion to the “extraordinariness” of the claim. This is why an ad ignorantium argument fails here; it doesn’t offer any positive evidence for an extraordinary claim, only absence of evidence. Whenever possible, the best way to make an argument from ignorance is to make an argument from elimination. Suppose you lost your keys in your three-room apartment. You know the key in is your apartment because you had to unlock the door to get in. You didn’t go into one of the rooms. You thoroughly searched the second room. You can now reasonably conclude that your key is in the third room. In other words, if you systematically eliminate all competing hypothesis, you can reasonably argue for the remaining one by indirect evidence. P1. I find X implausible. C. Therefore, X is false or implausible. P2. If I find something implausible then it is either false or implausible. C. Therefore X is implausible. It doesn’t take much to see why this is a weak argument. Arguments from personal incredulity are usually used by people who are non-experts arguing against a standard scientific view. That fact that a non-expert can’t understand the reasoning and evidence of experts is no argument against the plausibility of a claim. Perhaps the most common use of the argument from personal incredulity is used by conspiracy theorists and creationists. Example: I simply cannot believe that humans came from monkeys/bacteria, etc… Implied conclusion: Therefore, the theory of evolution must be false. The fact that a non-expert in evolutionary biology cannot understand or believe a theory that took 100s of history’s most intelligent humans to discover and verify is no argument against the theory. As a general rule, on matters scientific if your views are contrary to what experts believe, assume it’s you making the mistake. This is called “epistemic humility”. To illustrate, imagine you get a question graded wrong on a test in chemistry, biology, math, etc…. What is more likely: You got the wrong answer or you’re right and your professor doesn’t know his discipline? For any complex event there will be details and artifacts that, for someone with limited and indirect knowledge of the event, will appear to be strange or out of place. Looking for these anomalies then insinuating they are “evidence” for or against some hypothesis is know as anomaly hunting. Often anomaly hunting, arguments from ignorance and personal incredulity work hand in hand. The important lesson can be distilled into the same lesson I’ve been repeating since we started learning about inductive reasoning: Inductive arguments are probabilistic and as such must be evaluated relative to competing hypotheses and explanations. Pointing to an anomaly or citing a lack of evidence on their own don’t usually constitute positive evidence for anything — unless they are part of an argument by elimination. They are, however, sometimes reasons to challenge existing explanations if they can’t reasonably account for the anomaly. That said, an anomaly or lack of evidence does nothing to explain the event or phenomena we seek to explain and so usually cannot be used to support a particular positive conclusion. (b) evaluate each premise for acceptability. (c) give a finally assessment of the overall strength of the argument. There’s no evidence that the ancient Chinese had cell phones, therefore, I doubt they had them. P1. There’s no evidence that the ancient Chinese had cell phones. P2. There’s been a reasonable search for relevant evidence by archeologists working in China. C. Therefore, they probably didn’t have them. P1 seems acceptable–at least to my knowledge. P2. Acceptable. There are many archeological sites and so if the ancient Chinese had used cell phones, they’d have turned up in digs by now. You can’t prove that X doesn’t exist therefore X does exist. As mentioned in the lecture notes, there are several reasons. In the exercises below, when you see this (or similar) structure just say: Bad argument from ignorance because asks opponents to prove a negative which is impossible. The absence of evidence alone can’t prove that something exists. 1. Aliens are visiting us since no one has proven that they aren’t. 2. There’s no good evidence to believe aliens are visiting us, therefore they haven’t. 3. 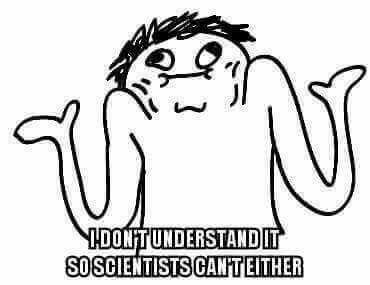 There’s no evidence of life in the universe besides on earth, therefore there probably isn’t any life elsewhere in the universe. 4. You can’t prove that CERN particle collider won’t cause a tear in the space time fabric leading to the end of the universe (Links to an external site. ), therefore it will. 5. There’s evidence you don’t understand arguments from ignorance, therefore you can understand how to evaluate this question. 6. No one has ever disproven Bigfoot’s existence, therefore, he probably exists. 7. I simply can’t believe the God would allow the earth to overheat, therefore climate change must be false. (Paraphrasing Senator James Inhoff (Links to an external site.)). (a) Explain/reconstruct how the anomaly is used as “evidence” for conspiracy. That is, reconstruct the argument from ignorance/personal incredulity. (b) In google, search the anomaly or claim followed by “debunked”. (c) Briefly summarize the debunking. Claim/anomaly: CNN reporter said “From my close-up inspection, there is no evidence of a plane having crashed anywhere near the Pentagon”. P2. There was a thorough search my experts for evidence of a plane crash and none was found. C. Therefore no plane crashed into the Pentagon and the whole thing is a conspiracy by the US government. In other words, he says there’s no evidence of a plane crash because the plane has been broken into such small pieces that someone who didn’t know what had happened would have had a hard time recognizing the source of the debris. 1. Re: Apollo moon-landing was faked! Claim: The astronauts would have died from radiation exposure. 2. Re: Apollo moon-landing was faked! Claim: You can’t see the stars in the photo of the moon. 3. Re: Apollo moon-landing was faked! Claim: The astronauts can be clearly seen but they should be in shadow. 5. Re: 911. Jet fuel can’t melt steel beams (therefore the buildings must have been part of a controlled demolition. 6. Re: 911. The Silverstein group purchased the lease on the World Trade Center for $3.2 billion. With two claims for the maximum amount of the policy, the total potential payout is $7.1 billion, leaving a hefty windfall profit for Silverstein.